She is a single orphan but has not lost the confidence to work hard and help her school. In Zambia, Prefects help the school administration by ensuring that all school roles are followed and act on behalf of a teacher when there is need. Only well disciplined and hardworking pupil are chosen as Prefects. Grace helps maintain discipline and order in her school. 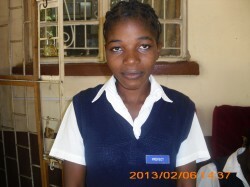 Grace Akufuna, A prefect at St. Mary’s Secondary School.